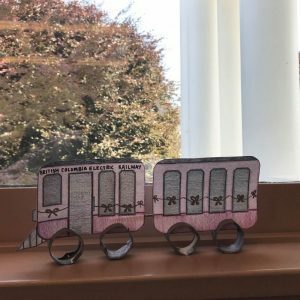 During my time with the Chilliwack Museum and Archives I was tasked with creating a miniature exhibit for the archive’s reading room, a project which proved to be one of the most challenging projects I have taken on as a summer student. Topic choice was the first challenge I needed to overcome. With Chilliwack’s history offering a diverse range of topics, it was difficult finding one that was both intriguing and able to be displayed in one display case. 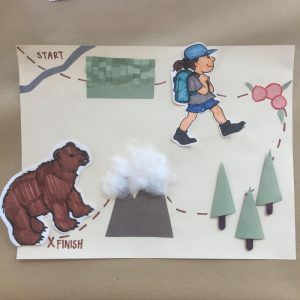 Narrowing down topic choice was a long process.While I found lots of engaging stories, events, and timelines, I was always faced with the question of “Will other people find this interesting?”. Luckily, a few seemed like they would. One of these topics was the logging of roads in the 1890s, which would become the roads Chilliwack still uses today. After a few afternoons of research, however, I realised that while there was enough information to know logging had happened, the amount of information I was able to find was not enough to mount a mini-exhibit. I chose to find a new topic. 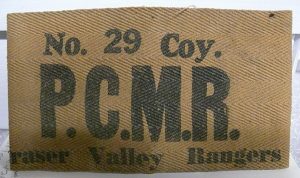 After a few more hours researching and a following a few new ideas, I found the Pacific Coast Militia Rangers (PCMR). 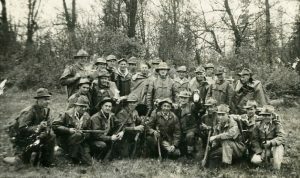 Digging through the archives, I managed to find plenty of useful information in a few short hours, including news articles, archival material, and artifacts. It appeared the only work left was to make some labels and put it all in a case. At this point, I was faced again with the small size of the display case. While the case is large, it could not accommodate all of the material I had uncovered. After an editing process and considering space restrictions, I decided to narrow the topic to an exploration of the PCMR through a social lens. Scaling down the topic allowed for the topic to become more manageable and while allowing the amount of material to remain workable. The result of this was an interpretation and a story local to Chilliwack. I now had to make my interpretation accessible to a number of age groups. This meant taking my own thoughts and trying to explain for demographics of all ages, which was the most difficult part of the project. This was because I needed to both keep my original message and make it accessible to younger age groups. Overall, I am grateful that I had the chance to make this exhibit. The challenges I was faced with have better prepared me for the goals I hope to accomplish in my professional life and I will be pleased to carry them with me. The exhibit is scheduled to open August 17, 2018. 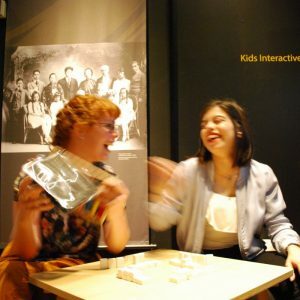 Stephanie and I playing Mahjong in the Gold Mountain Dream exhibit. Once again, I find myself shocked that the summer is nearing its end and my time at the museum is coming to an end. This summer, I was given the opportunity to work at the museum as a summer student for a second year. Last summer was a major learning curve, as I was newer to the museum and how it worked. This year, I was familiar with the place and the staff, creating a comfortable environment to jump right in! 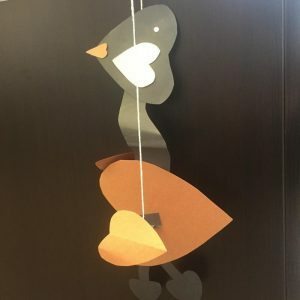 May was an exciting and busy month as we celebrated the 60th anniversary of the historical society and hosted the British Columbia Historical Federation Conference. During the conference, I had the opportunity to go on a Hops Tour. Learning about a major industry for both Chilliwack’s past and present was an exciting experience. We toured hop fields that had been used decades ago when hops were a booming industry in Chilliwack. One of my favourite things from this summer was our Cardboard City, held in the Chambers Gallery. After mapping out a section of the downtown area, we used larger cardboard to create the blocks. Once we had our blocks and streets mapped out, we decided to add a few historic buildings such as the museum, the British Columbia Electric Railway Station, the Paramount and a few historic hotels. 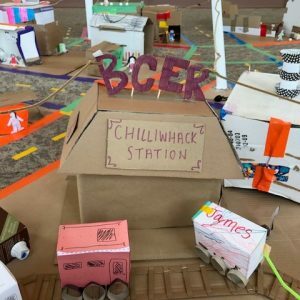 Once this basic outline of “Chilliwhack” (our unofficial name for the cardboard city) was complete, we opened our city up for construction for two weeks. Within the first day we saw a great turn out, new buildings such as Sticky’s Candy and the Book Man were added. Over the course of the two weeks, members of the community continued to take part and add to Chilliwhack. By the end, our city limits were jam packed with various buildings, vehicles, people, even piper-cleaner powerlines and Cultus Lake. 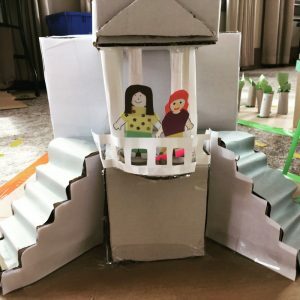 Cardboard City was one of the projects I was most excited for this summer, and I am beyond happy with how successful it was! Overhead view of Cardboard City. 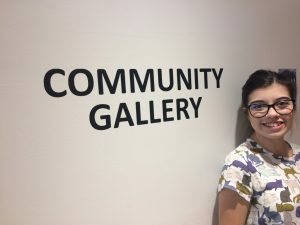 Having built a strong connection with the museum, I’ve learned more about Chilliwack’s history. Whenever I drive around town, I think of all the random facts I know about the various places in the community. As sad as I am to be leaving in a few weeks, I cannot help but look forward to working along side the archives and Stephanie, the Education and Engagement Coordinator, this fall as I will be creating a local history kit for my directed studies course. If I had not built strong connections at the museum, I may not have had the opportunity to combine my love of local history and education. I’ve had amazing experiences these last two summers and I cannot wait to see what opportunities will continue to come from having worked here. One of the things I most love about running summer family drop-ins is the flexibility they offer visiting families. It’s interesting watching a simple concept we decide to focus on for a week become something completely different when the variety of voices that join in change and adapt it. 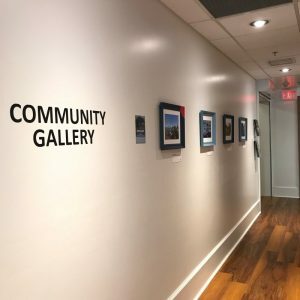 For the past two weeks we took over our upstairs programming room (we call it the Chambers Gallery as it’s the room where city council used to sit when this building was city hall) and transformed it into a cardboard City of Chilliwack. It was a simple idea, we’d map out an area around five corners, including some of the historic buildings in (roughly) the correct space. The rest we’d leave open, setting up tables of craft supplies for inspiration and creation stations for our visiting city builders. Sometimes all you need to do is provide a small spark for inspiration and the creativity follows. We didn’t try to create an accurate representation of five corners from any one era, but let our city builders (visiting families and children) decide what the city needed. Some of the buildings were recognizable, staples of downtown like The Bookman, complete with Nietzsche watching in the window, Sticky’s candy and even a “Boozeny’s” (Bozzini’s). But other additions were wishful like the two cupcake factories that popped up and the house that opened up to the front door of Sticky’s. By the end of the two weeks of cardboard city we had connected (pipecleaner) power, streets filled with interesting businesses and people scattered throughout. Well yes, but maybe not all silliness. 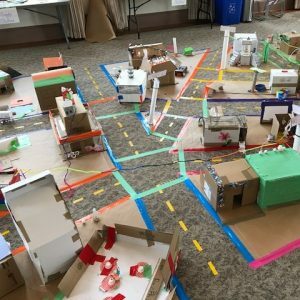 This is an informal learning environment – we had an idea of what might be learned from co-creating a cardboard city with our visitors, but there was lots of room for new discoveries. Not only did our visitors pick up on the few historic buildings we put in place beforehand and wonder about their history, but they were inspired to add something that they wanted to see in the city too. Ok, so maybe two cupcake factories is a little unrealistic, but what if we were inspired by our (real) city in the same way our visitors were by the cardboard city? Cardboard BC Electric Railway Station. While cardboard city may be over, we’re still offering a great line-up of activities throughout the summer. Check out our Summer Family Drop-in schedule!